On January 21, at the skiing lodge in the town Schuchinsk (Kazakhstan) the children's festival “World Snow Day” held fun and defiantly. Usually we had very cold weather in this period (called "Hard Frosts"), and we were happy that we had only -20 C, and it was warmer that days before and later. 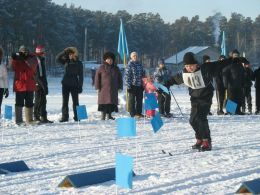 In the first part of holiday pupils aged 10-13 years competed in the "Fun relay" on skis. Each team school consisted of 5 boys and 5 girls and everybody had his own job. Someone ran without poles, another ran on one ski, the next passed through the gates of ski poles, and others collected flags spaced along course. The children, the parents, the teachers of schools were very fun, and fans so ardently supported their teams that we are seriously worried about that tomorrow they would be "without a voice". Team winners received cups, but the losers still not there, because every participant of the holiday got specially made for this day diploma, colorful stickers, badges and big tasty sweet. 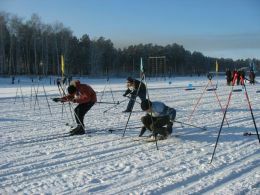 After the relays young athletes (8-14 years old) involved in ski racing schools competed. There was prepared for them an exciting "Race Shootout" where after each round filtered out the weaker members, and strong athletes continued to sort things out until they remained four, who played the main prizes: sports hats, stickers and flash-memory with the symbols of the World Snow Day, chocolate etc. There was very fun, interesting festival and all participans were very happy.